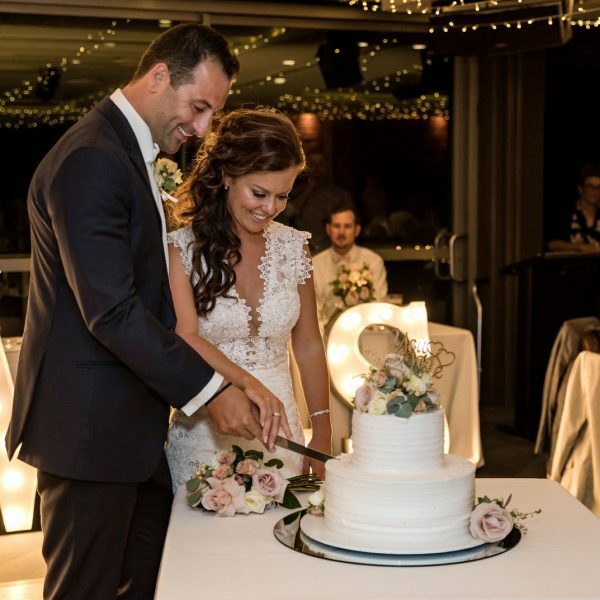 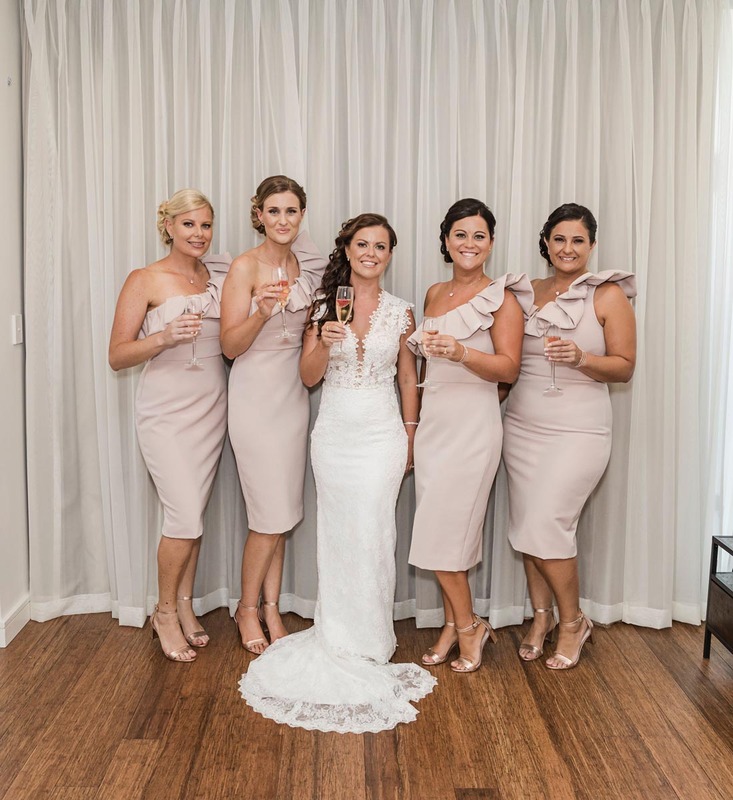 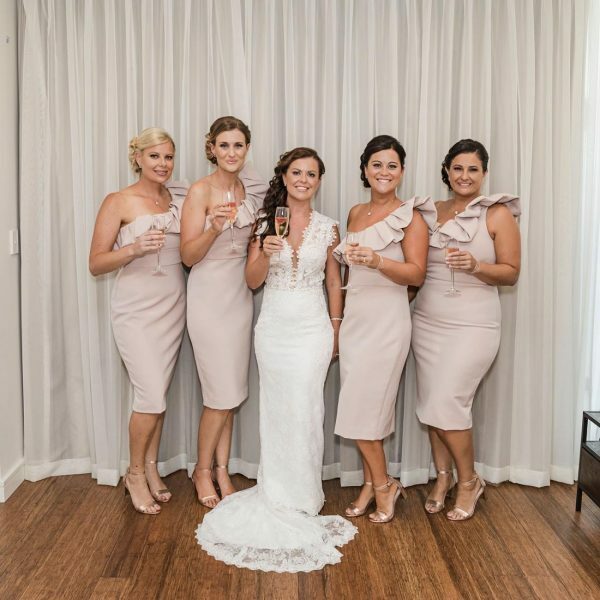 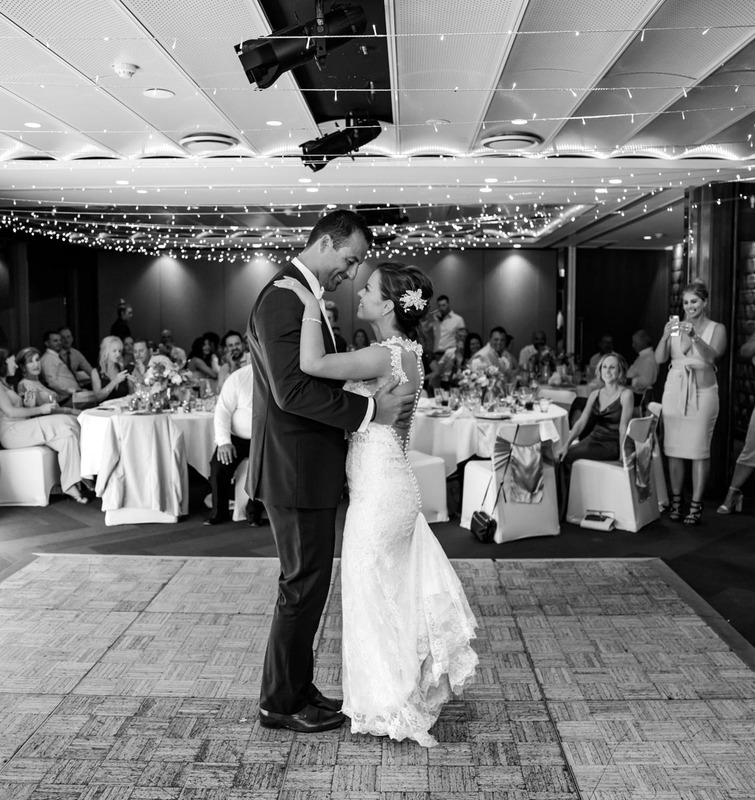 Jamie and Amie met each other in December 2015 on a sunny Sunday afternoon at Queen’s Wharf Hotel. 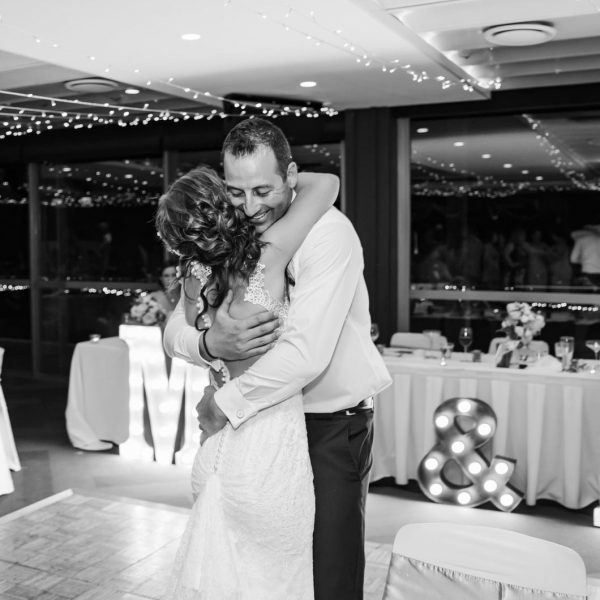 “We were both there listening to music and having drinks with some friends when we caught each others eye,” the happy couple tells us that at first they were both shy and it took them over 4 hours to finally get the courage to talk to each other, only after their friend’s intervened and introduced them. 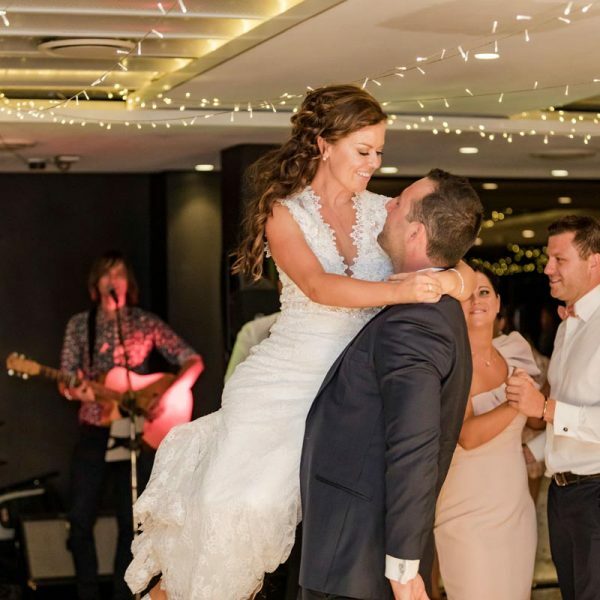 Jamie and Amie hit it off straight away and have been inseparable ever since. 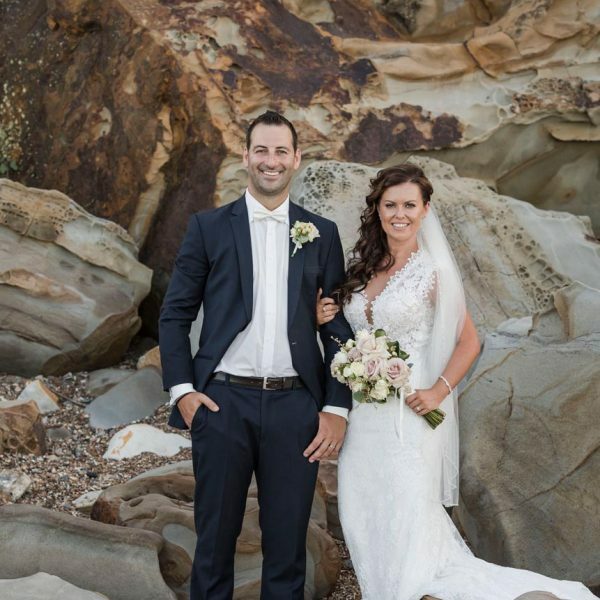 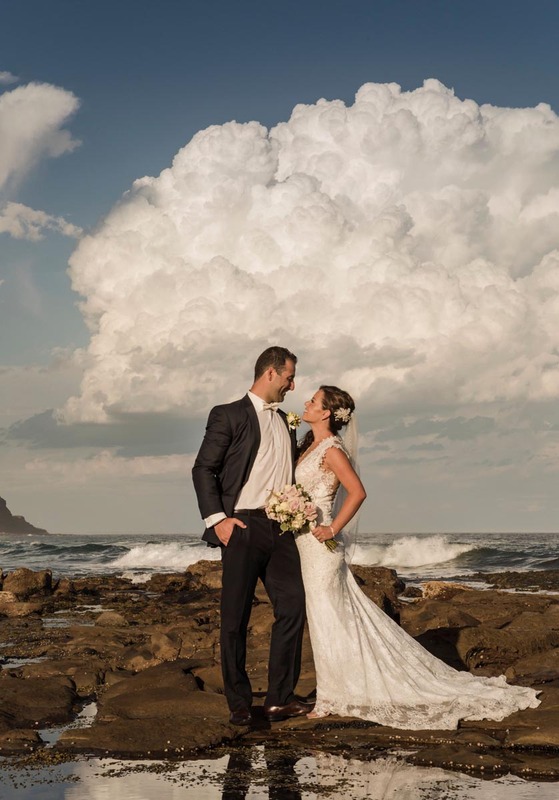 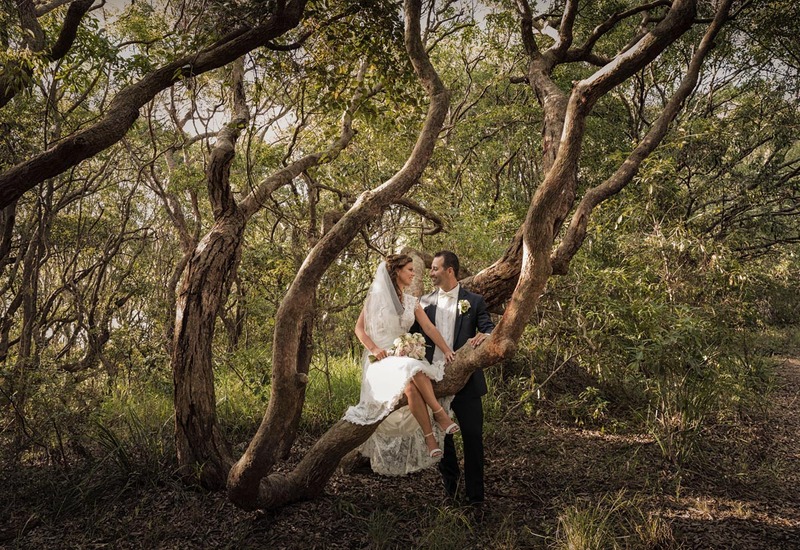 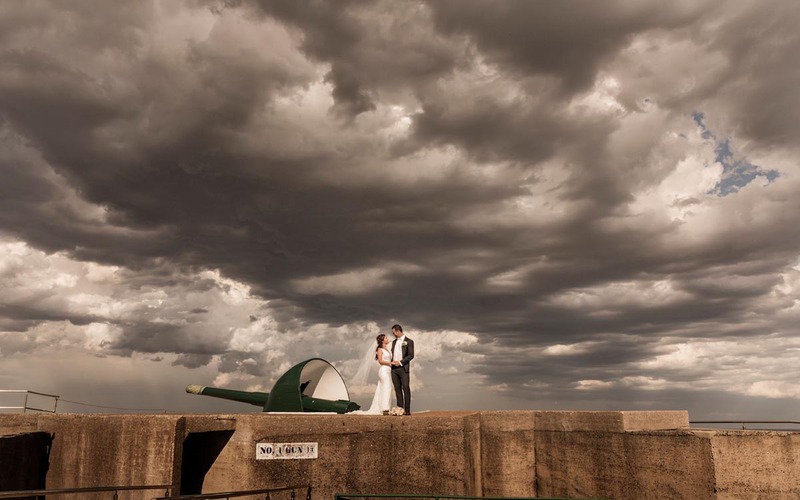 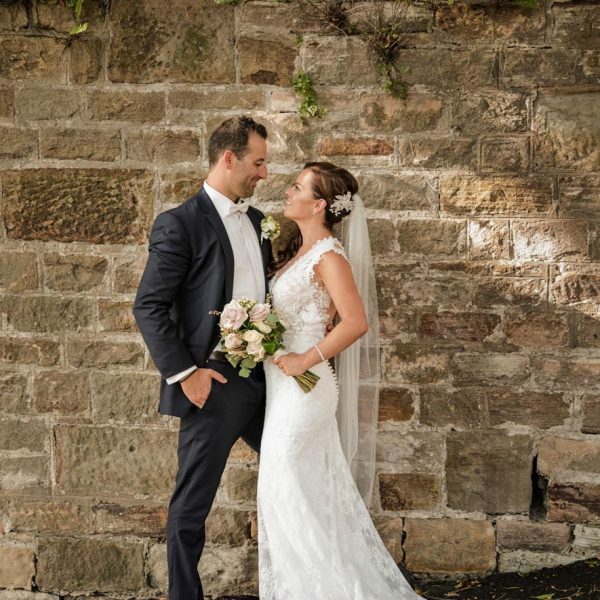 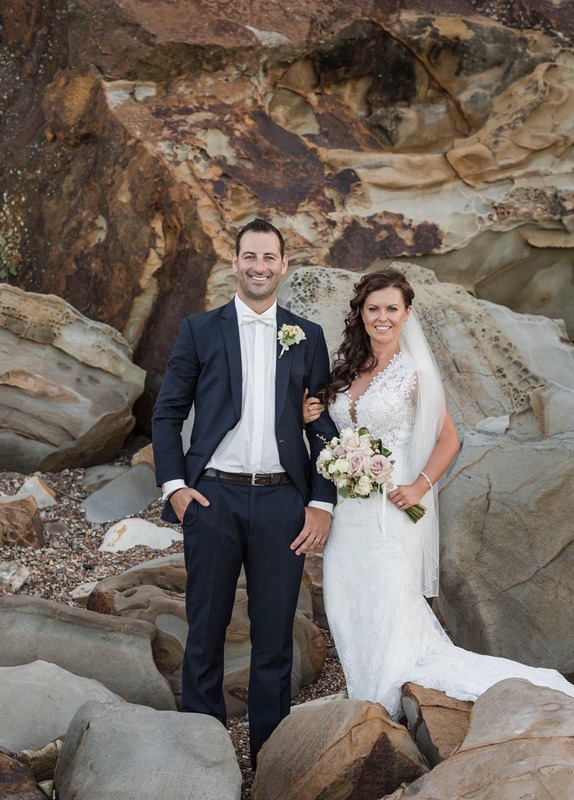 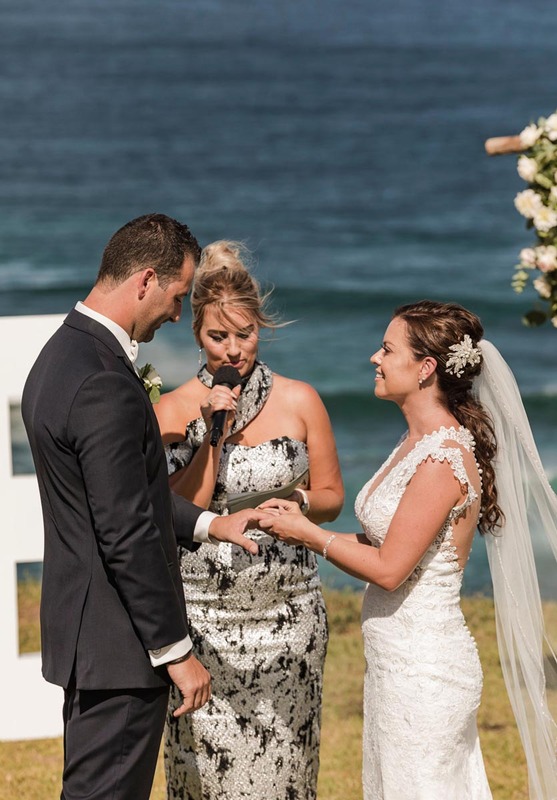 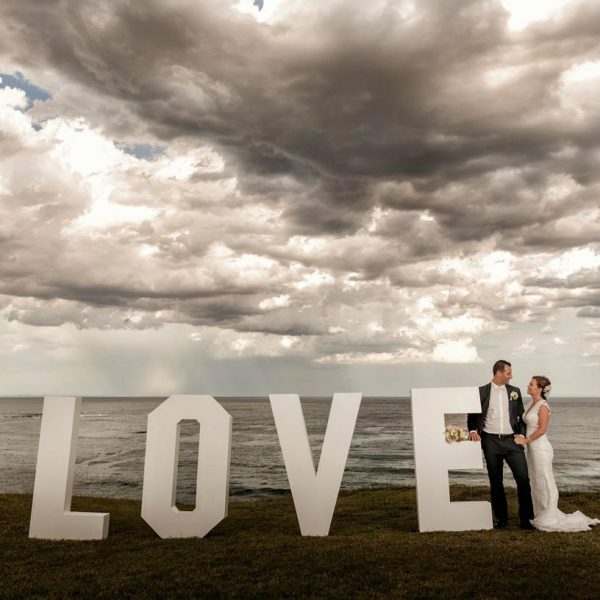 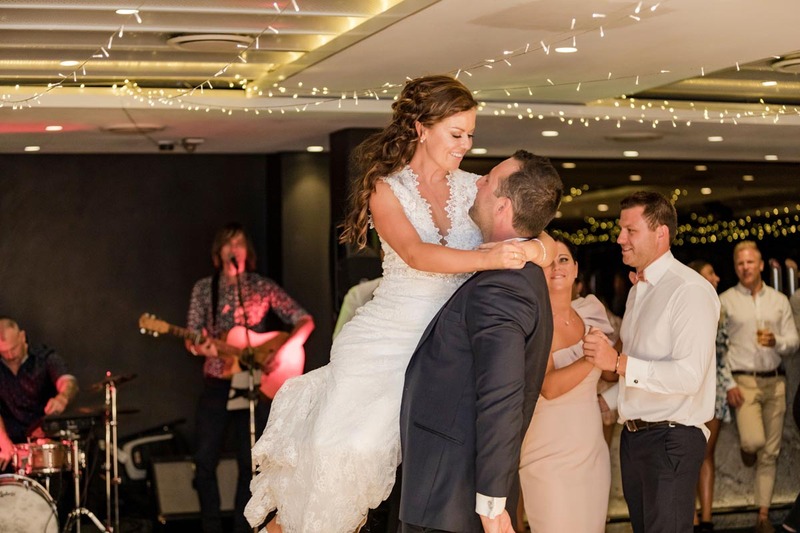 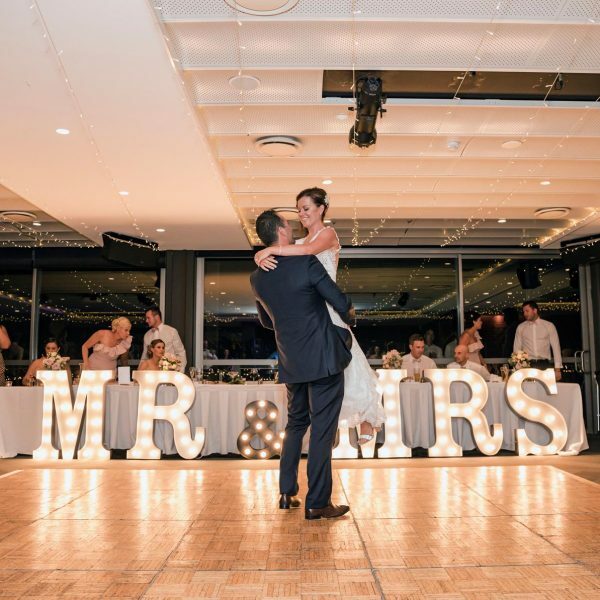 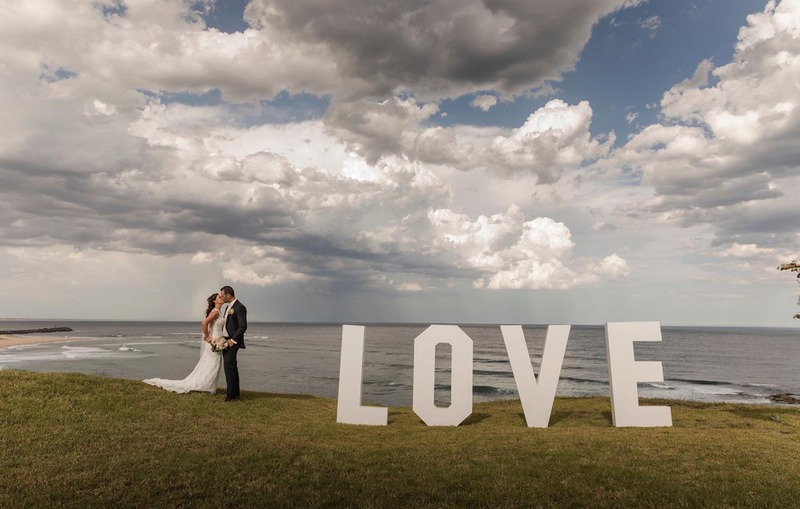 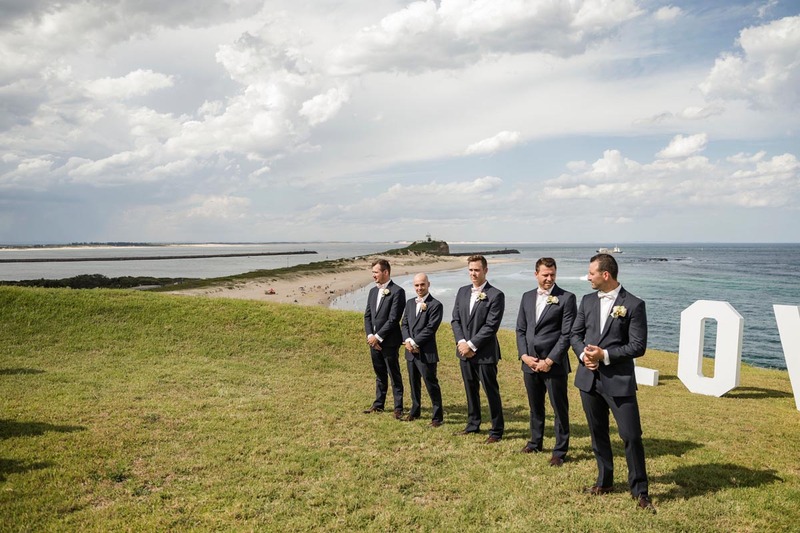 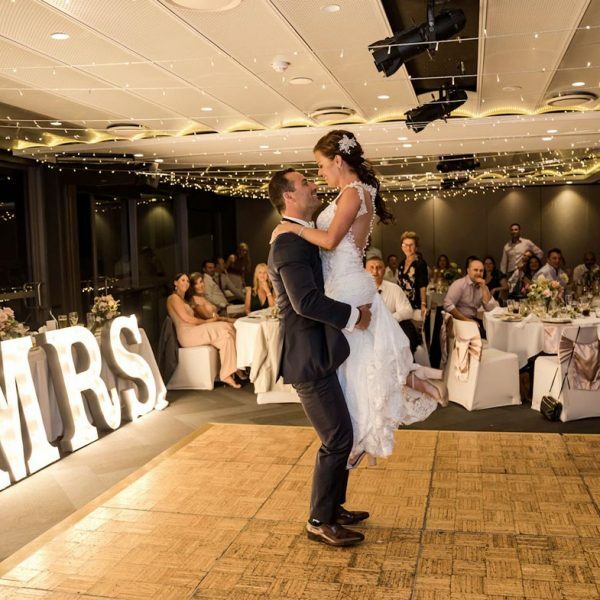 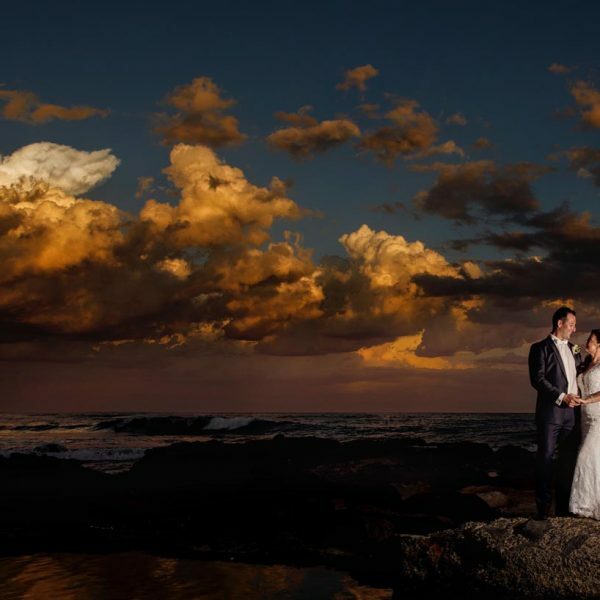 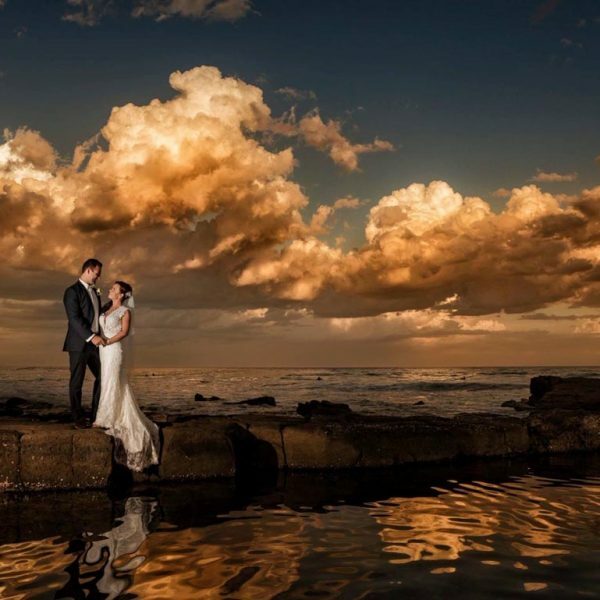 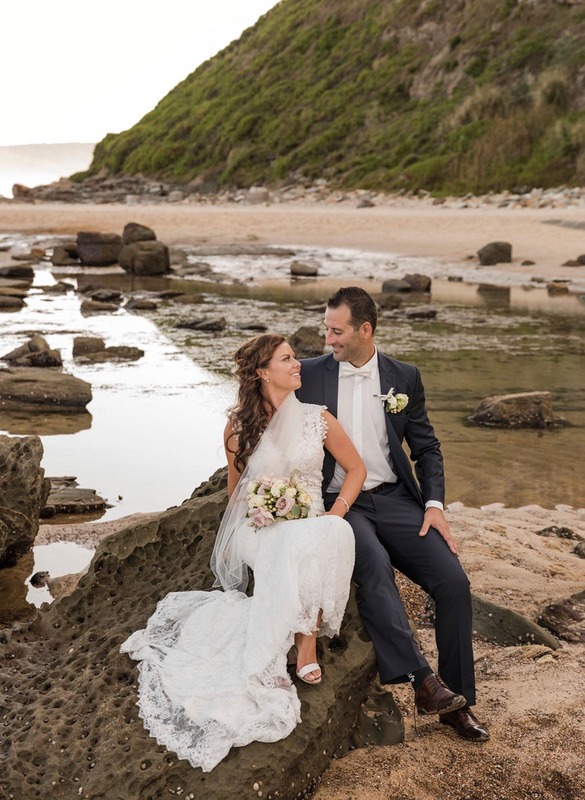 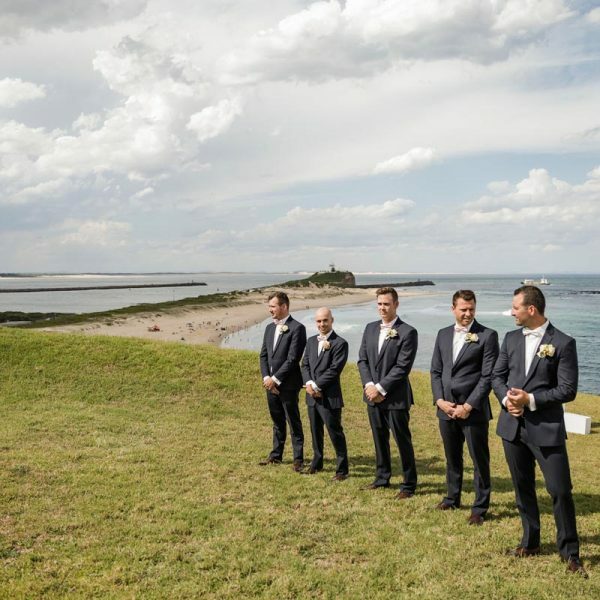 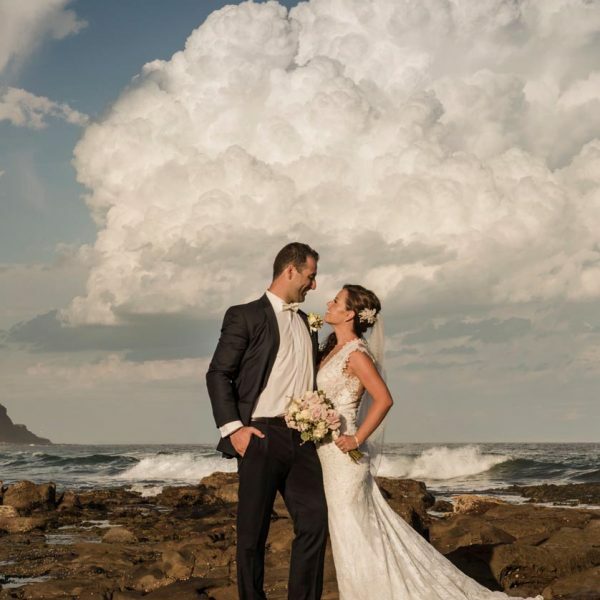 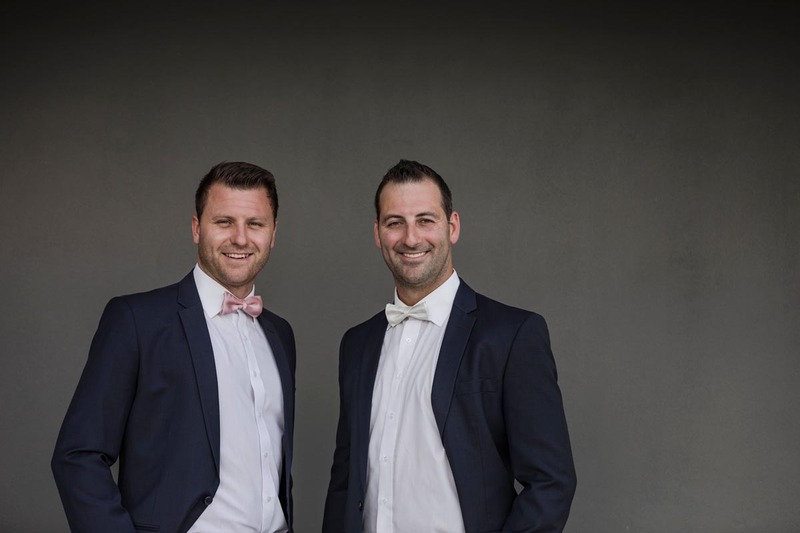 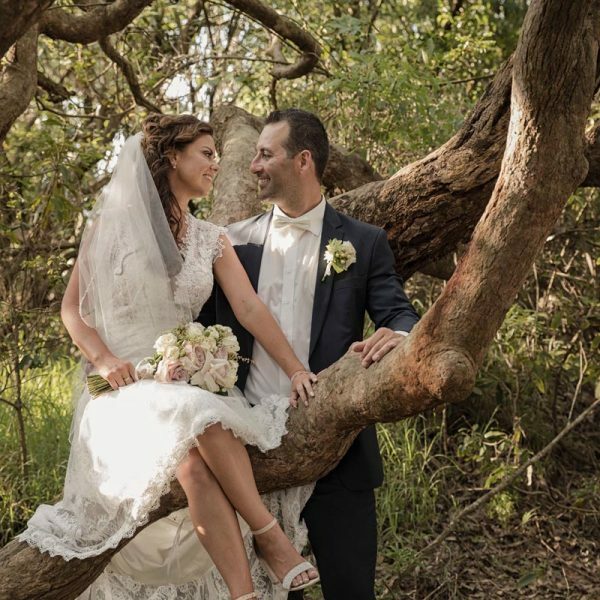 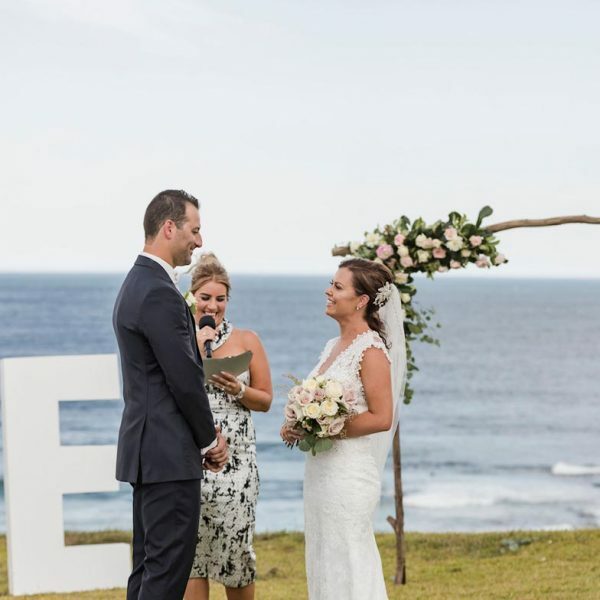 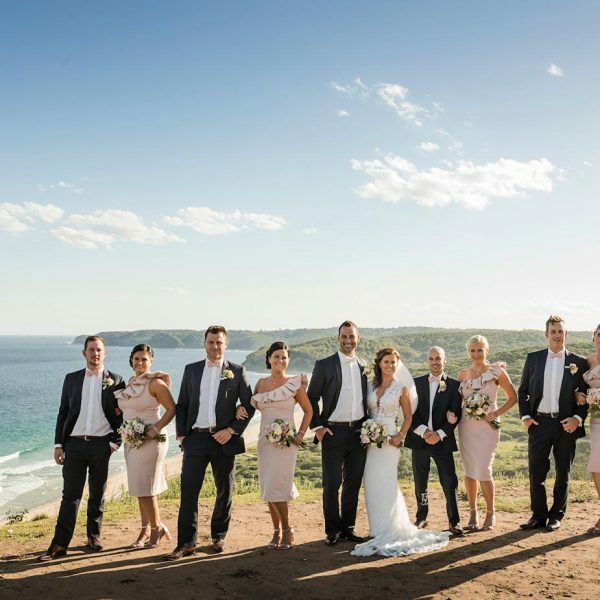 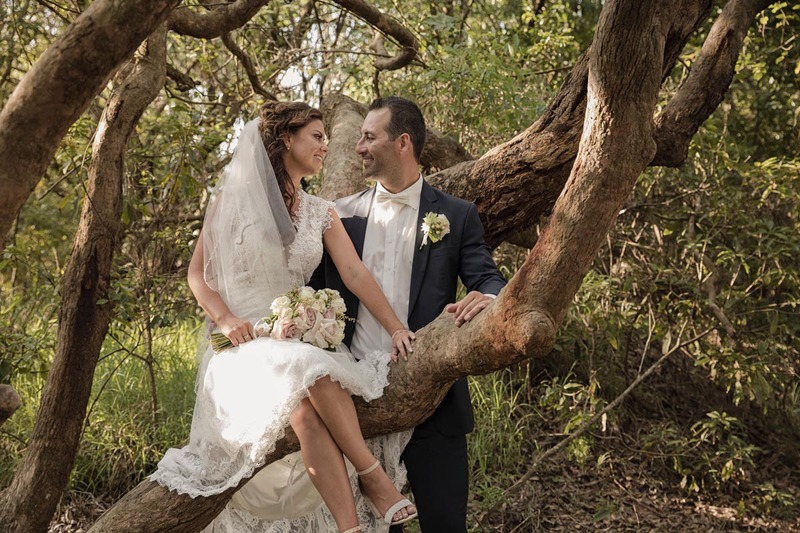 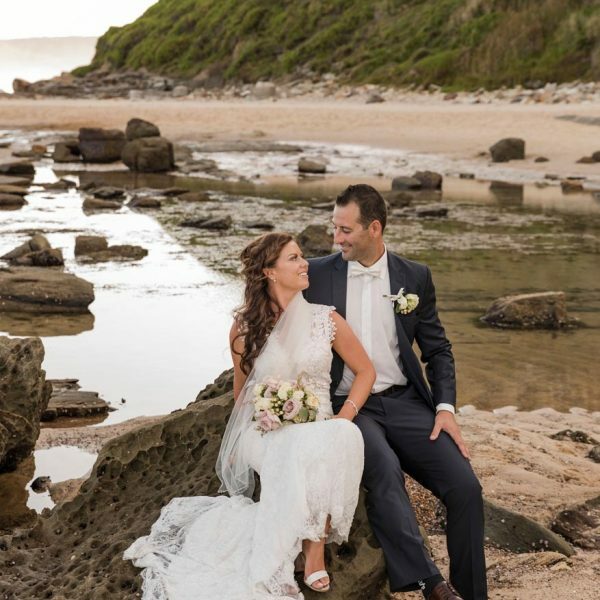 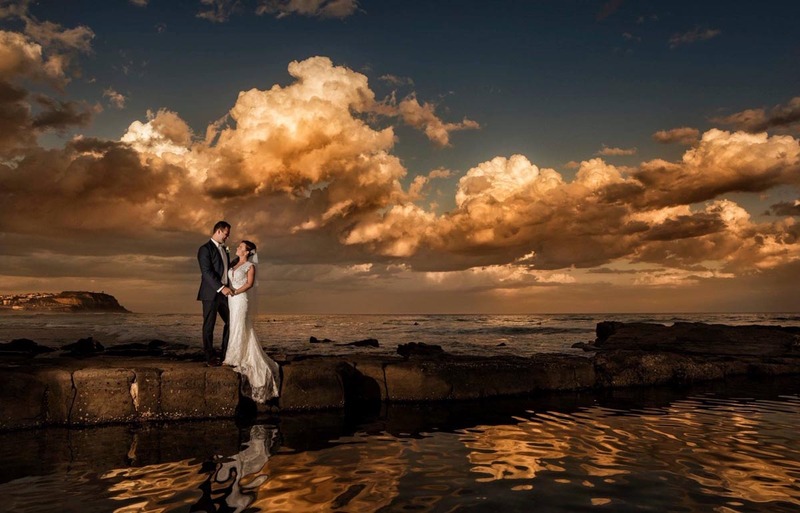 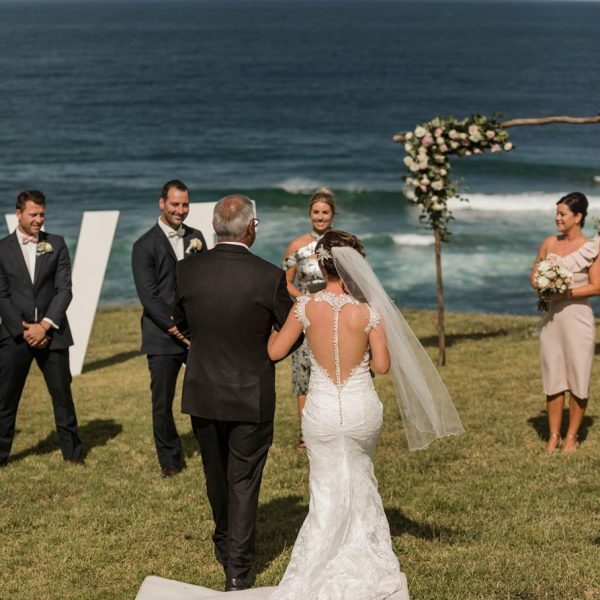 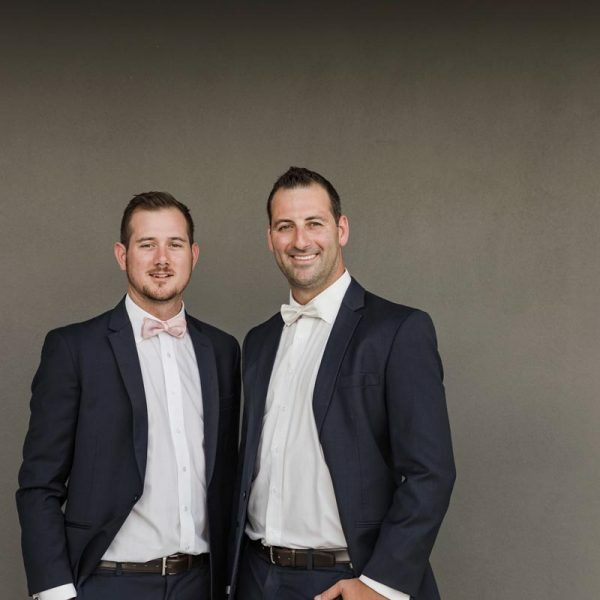 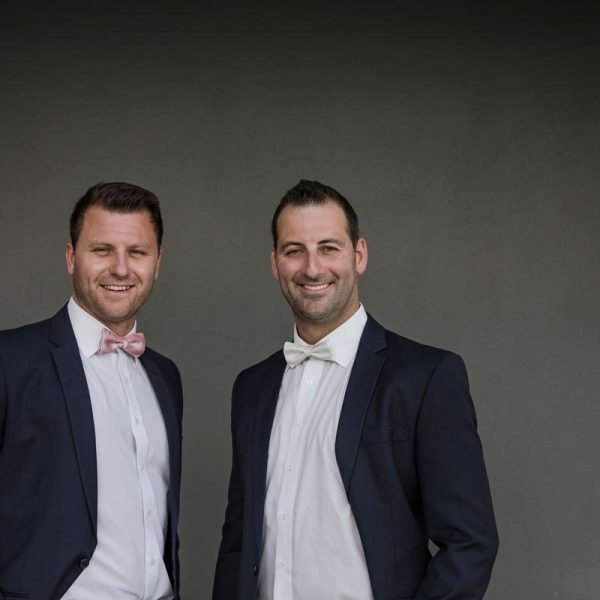 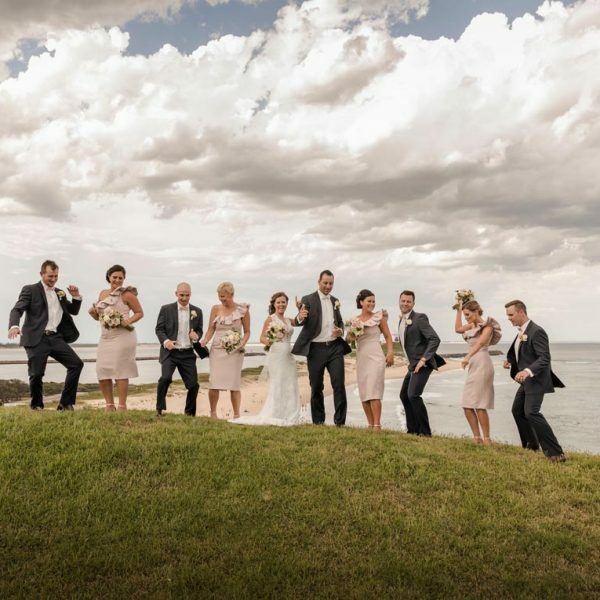 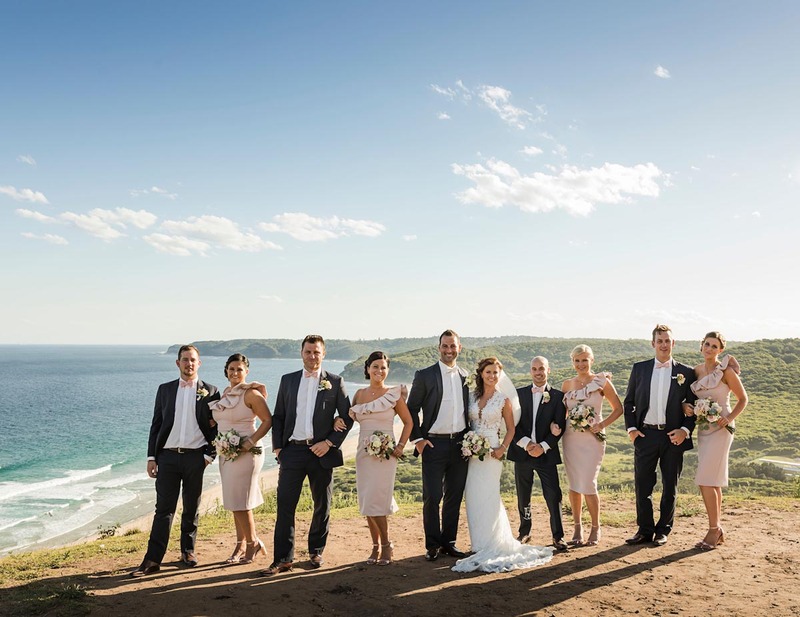 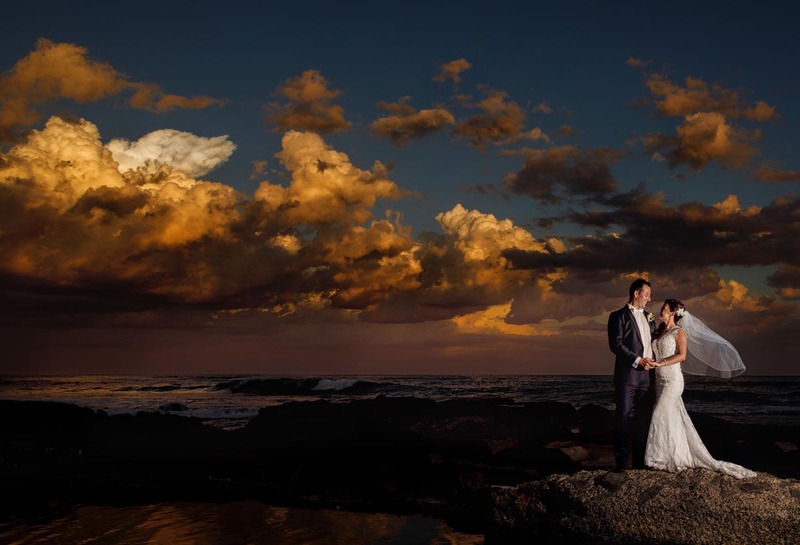 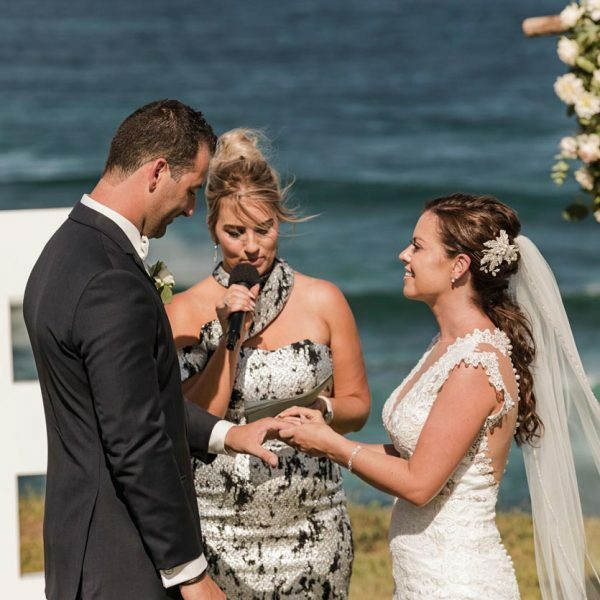 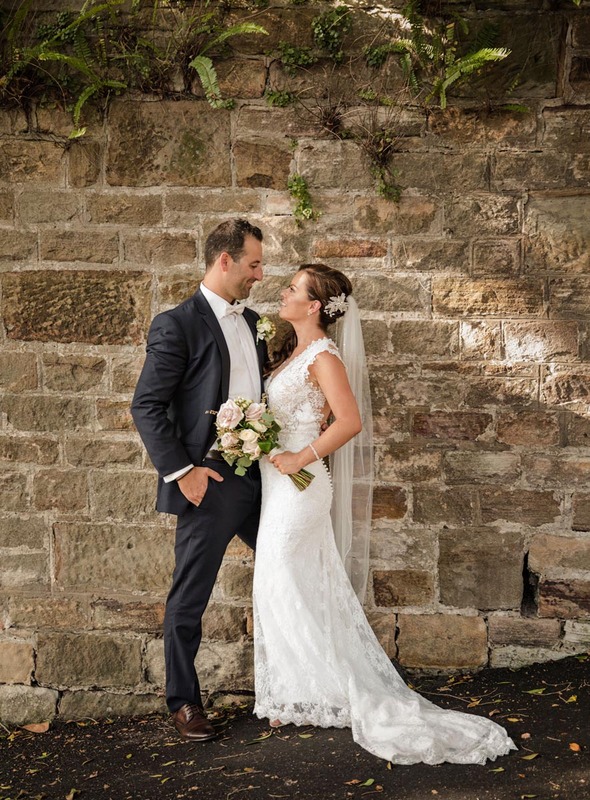 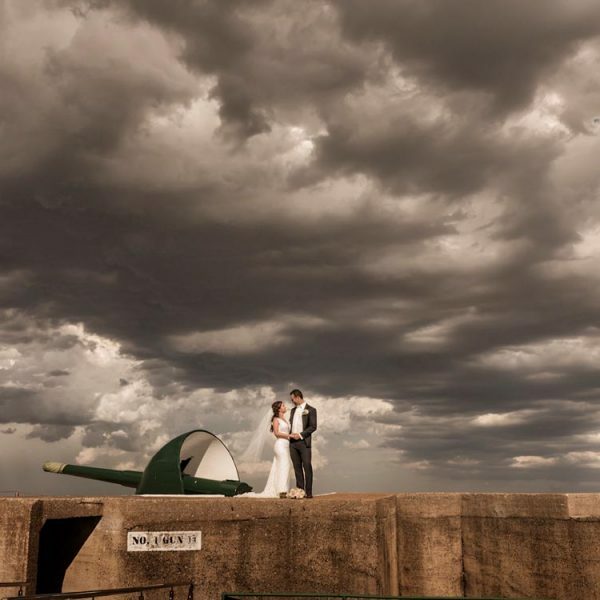 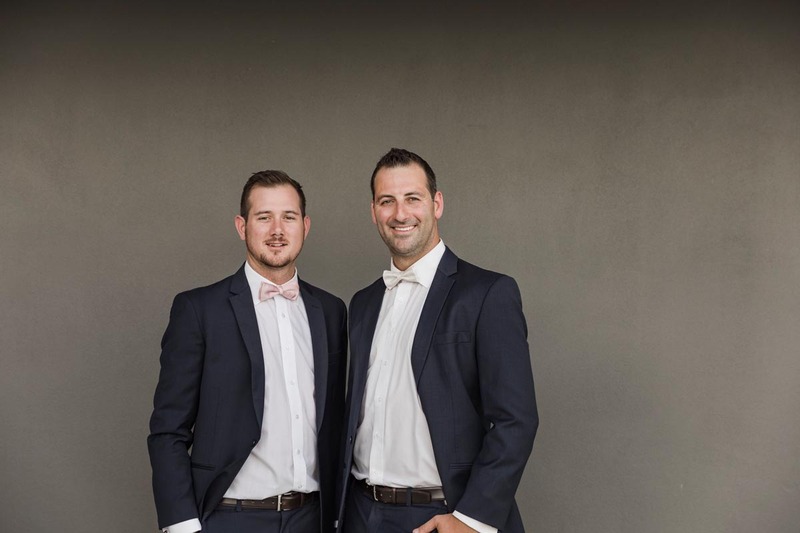 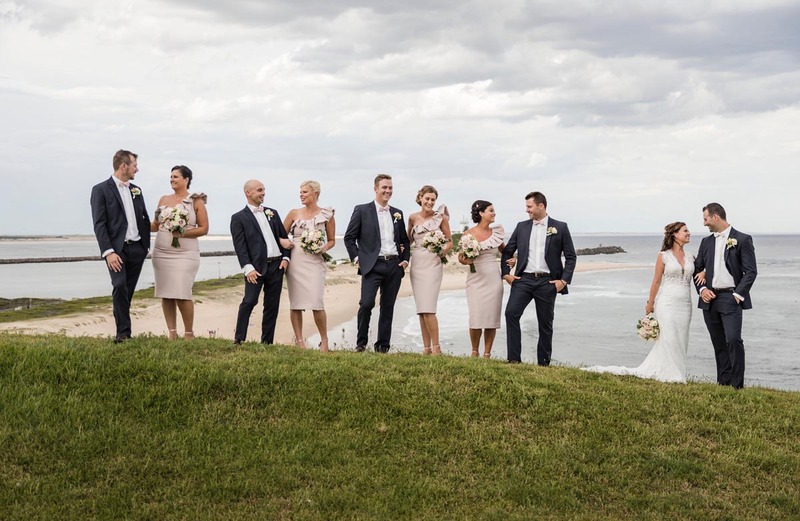 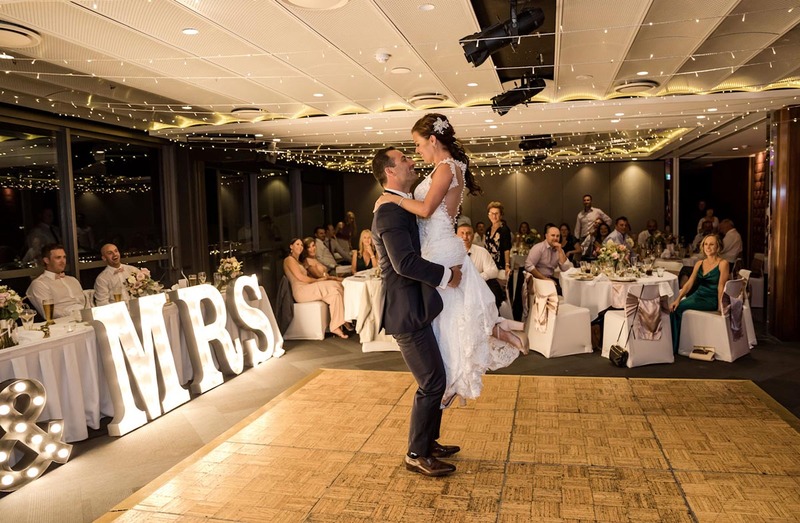 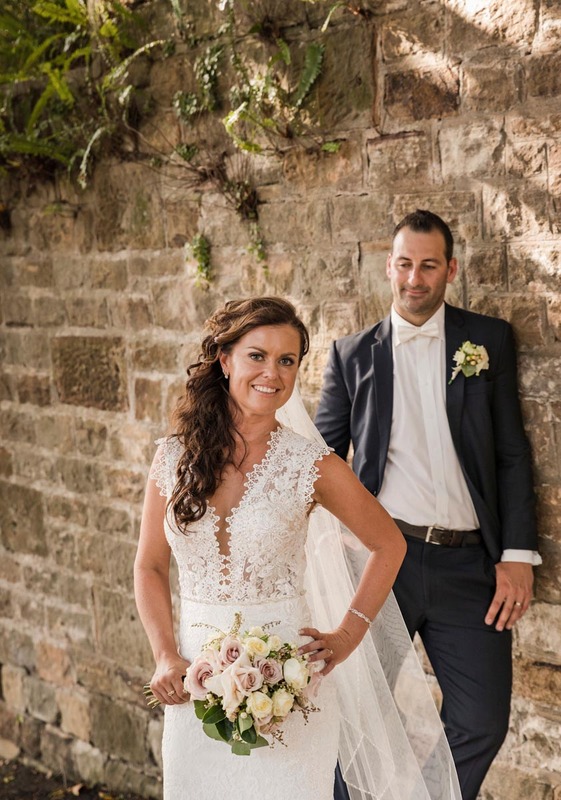 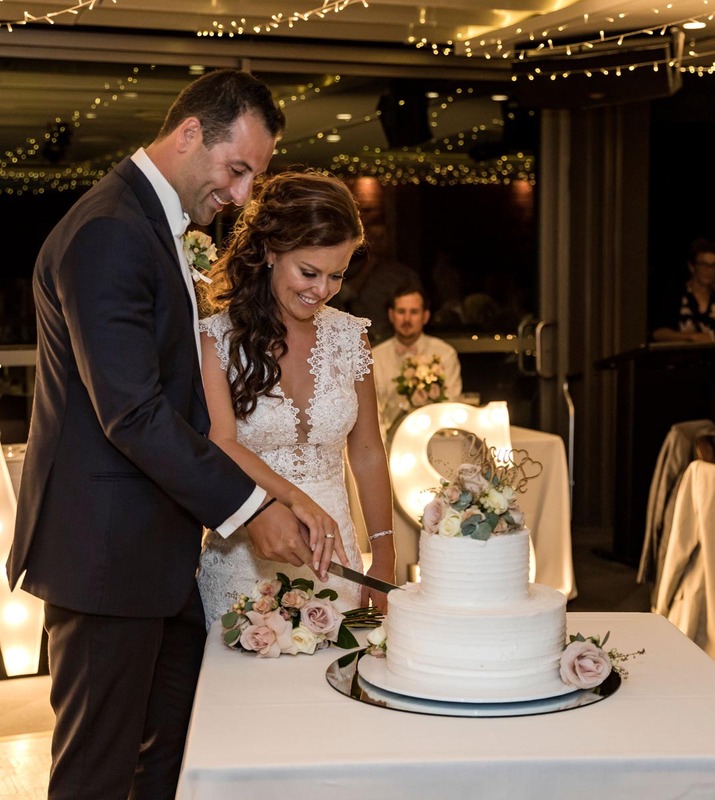 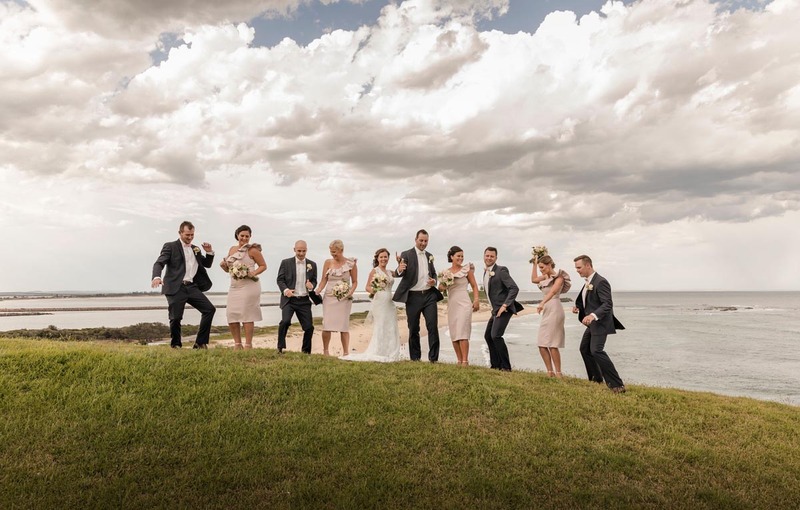 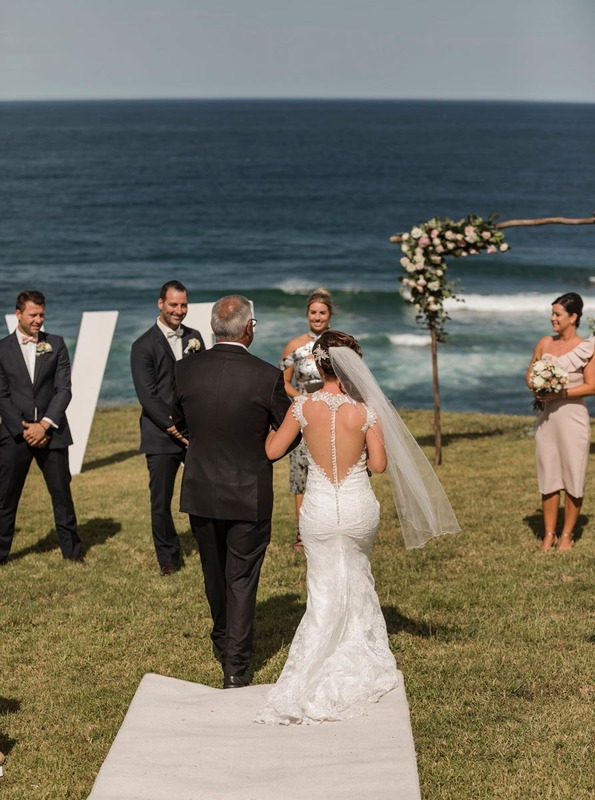 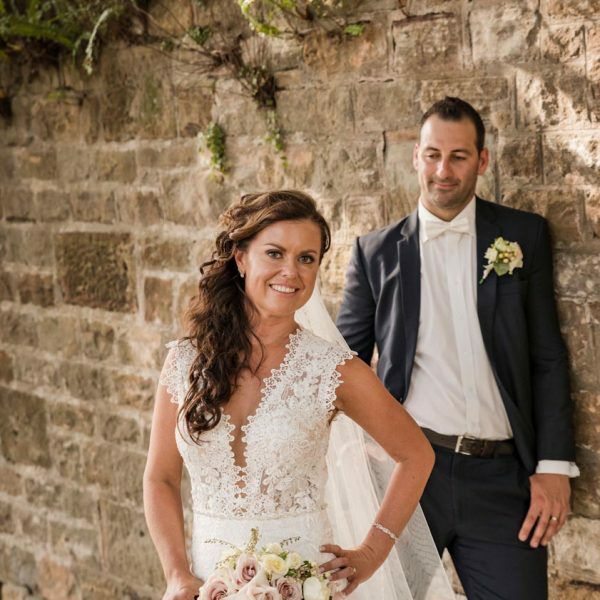 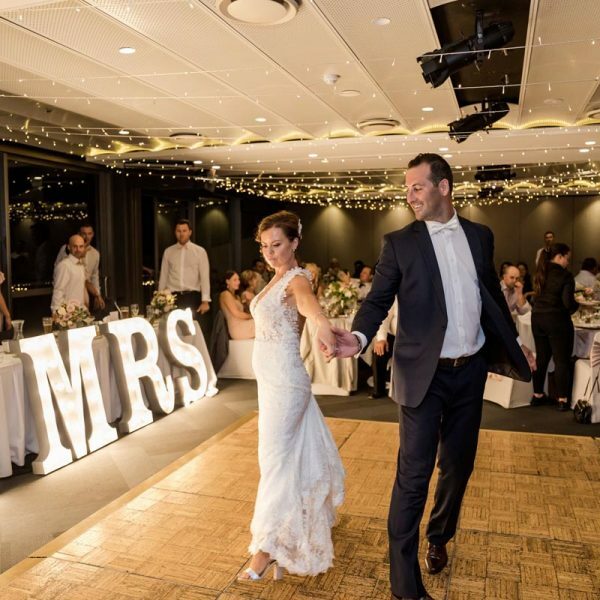 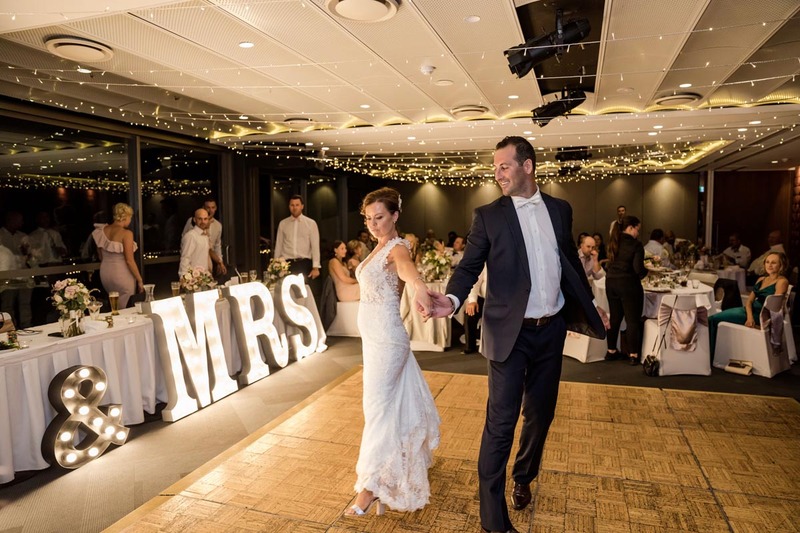 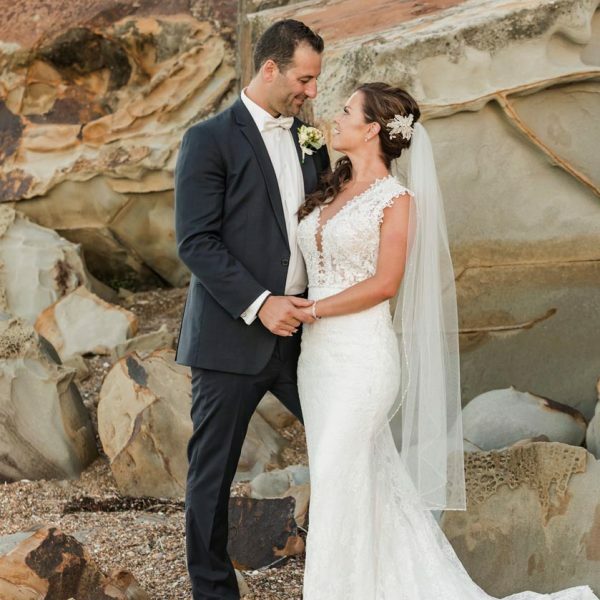 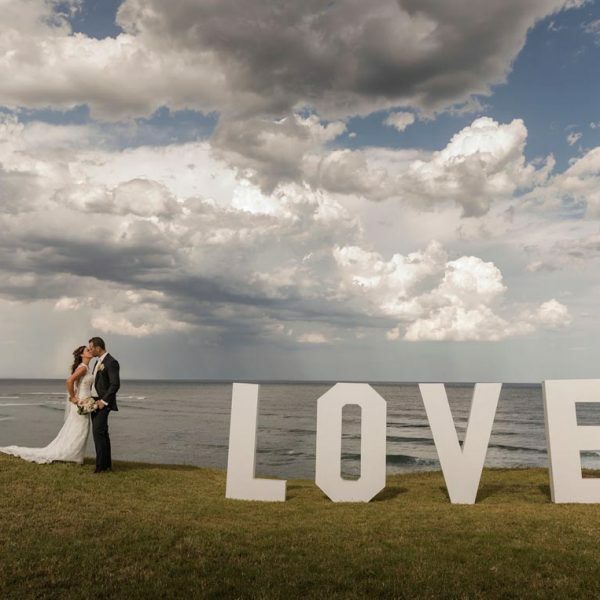 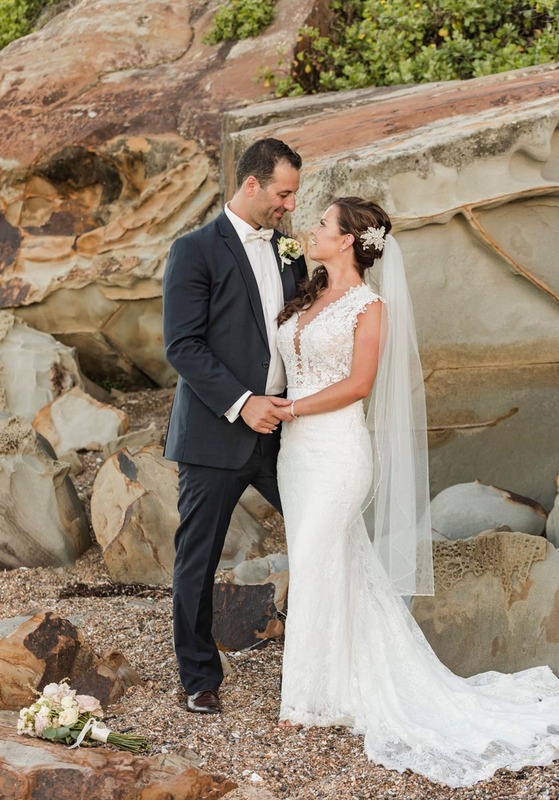 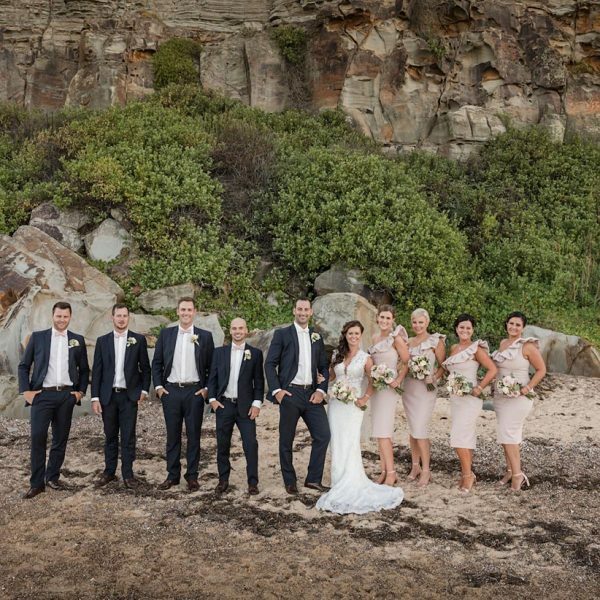 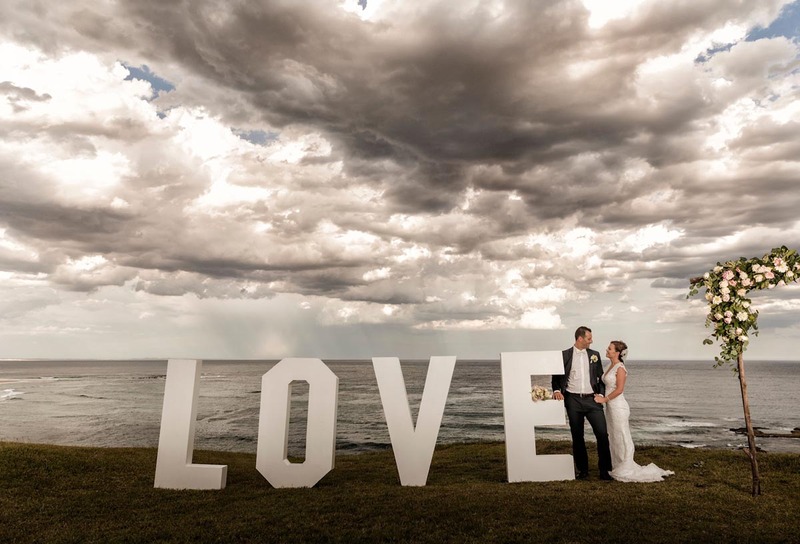 On 9th February 2019, Jamie and Amie were married in front of 125 of their closest friends and family on the picturesque Fort Scratchley cliff top. 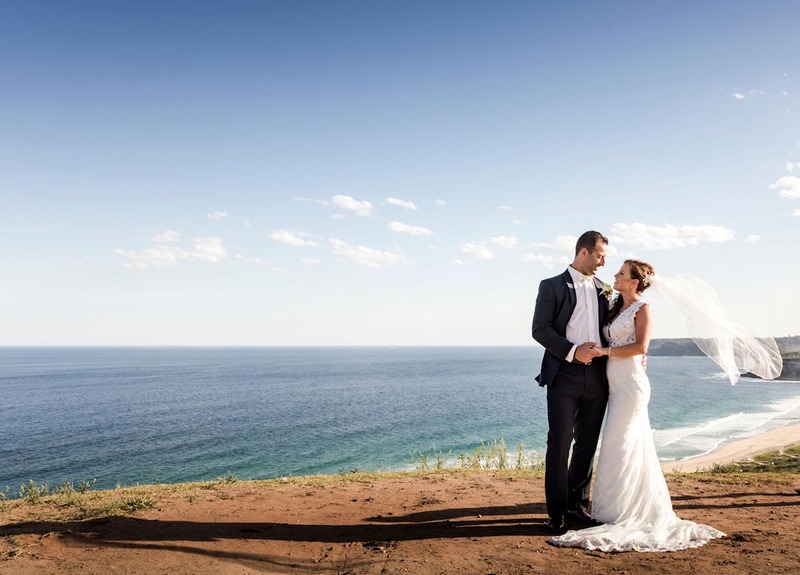 The stunning vista held significance for the couple as it overlooked the location of their first date: a walk along Nobby’s beach. 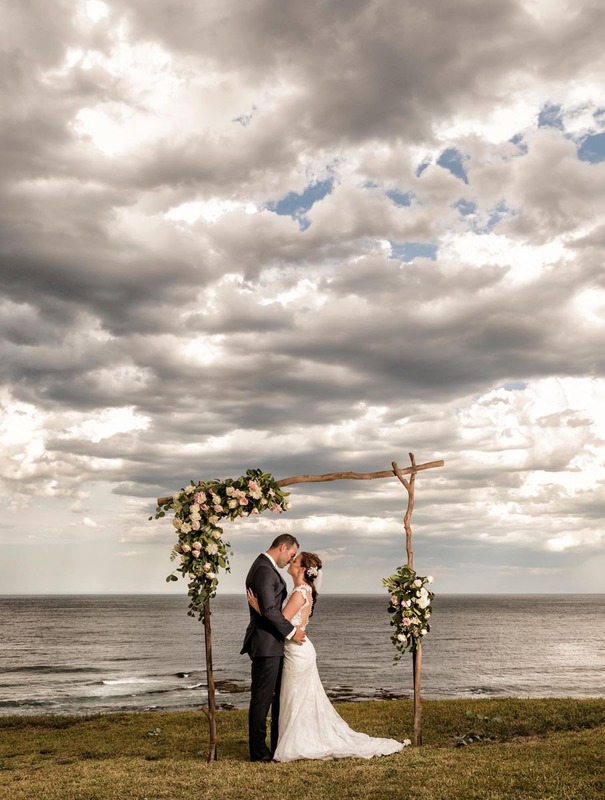 They also chose this venue as they felt it showcased what Newcastle is all about – the beaches and the amazing views. 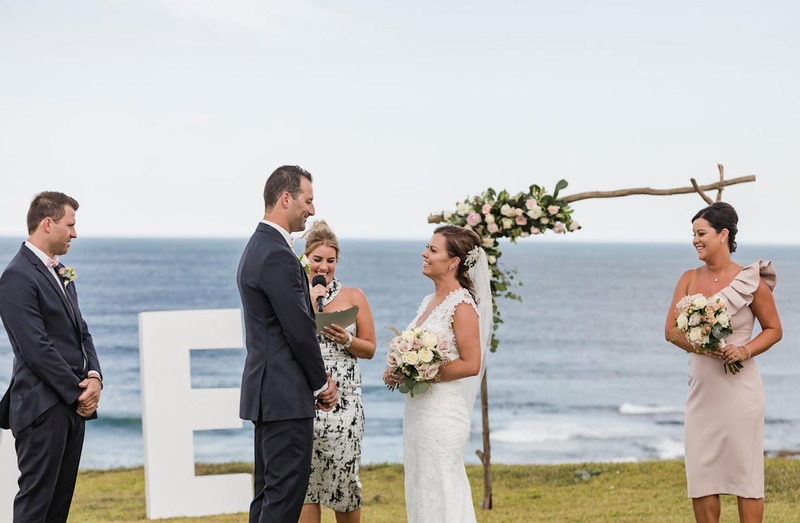 Jamie moved to Newcastle from Canberra for a temporary work position, and after falling in love with the beaches… and Amie, he decided to stay put. 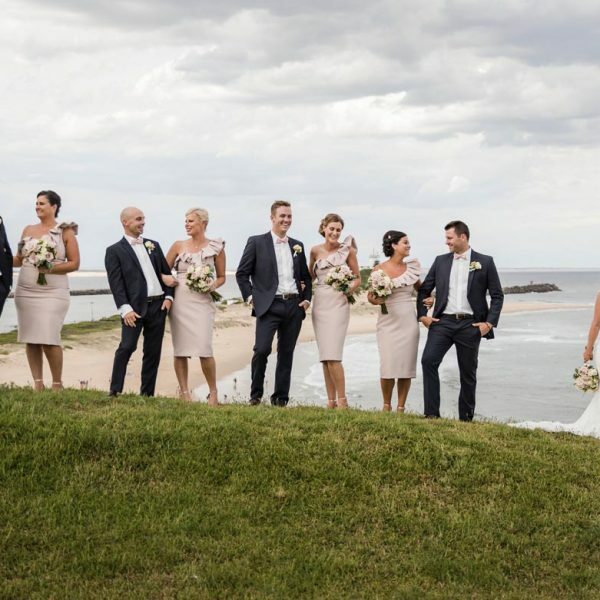 They knew they wanted to show off Newcastle on their wedding day to family and friends, especially those not from the area, so they made sure to host their wedding at one of the most beautiful places in the city. 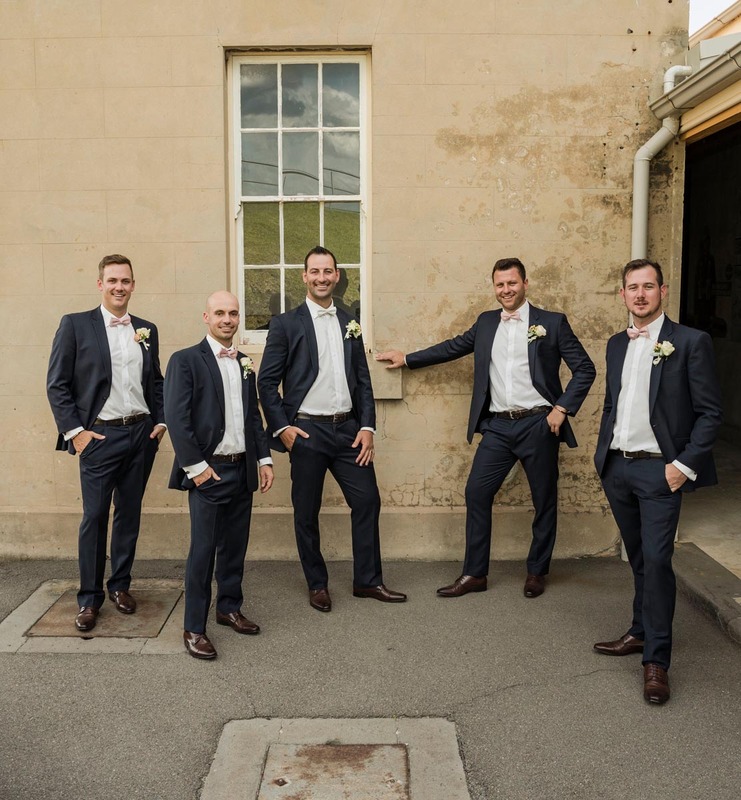 Jamie and his groomsmen Declan, Harry, Cameron and Dean looked dashing in Rundle Tailoring Navy Como formal hire suits, Sein Ivory shirts and Florsheim Clayton Teak shoes. 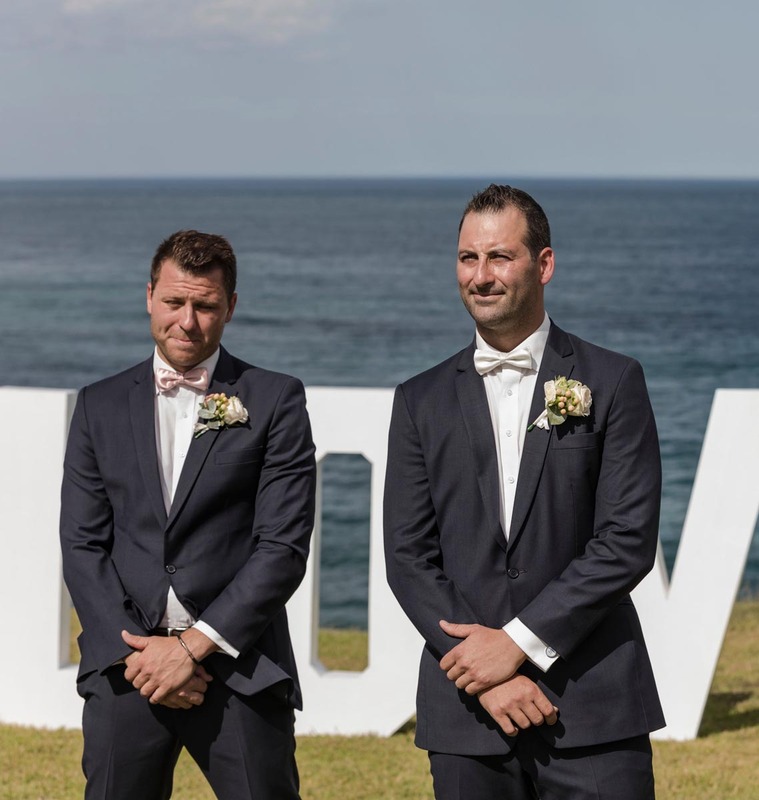 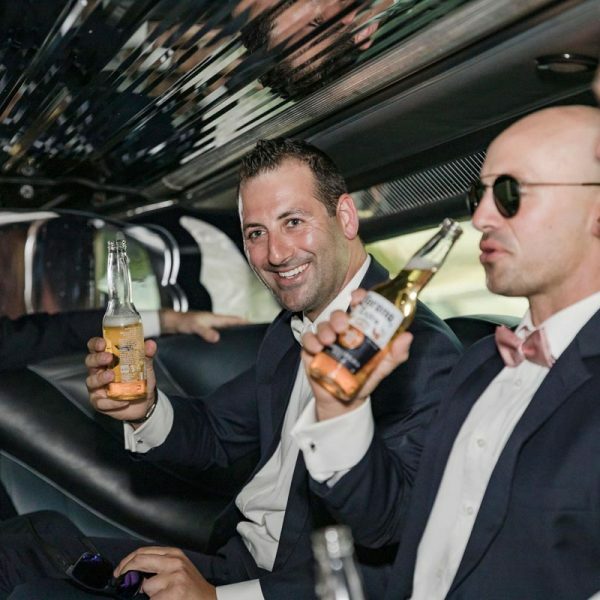 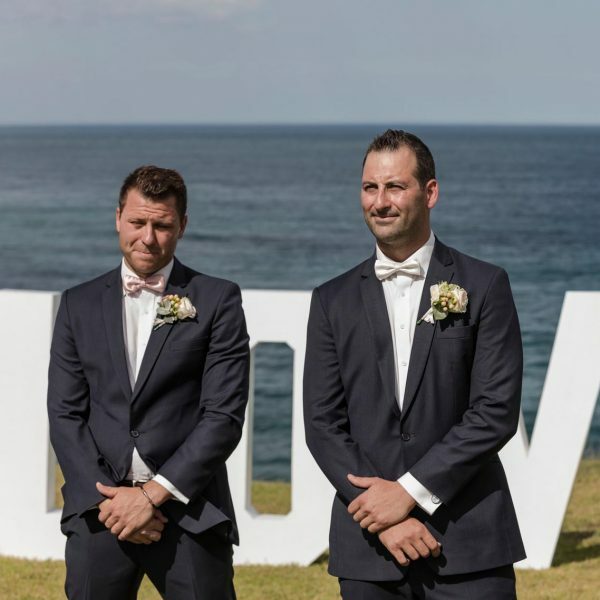 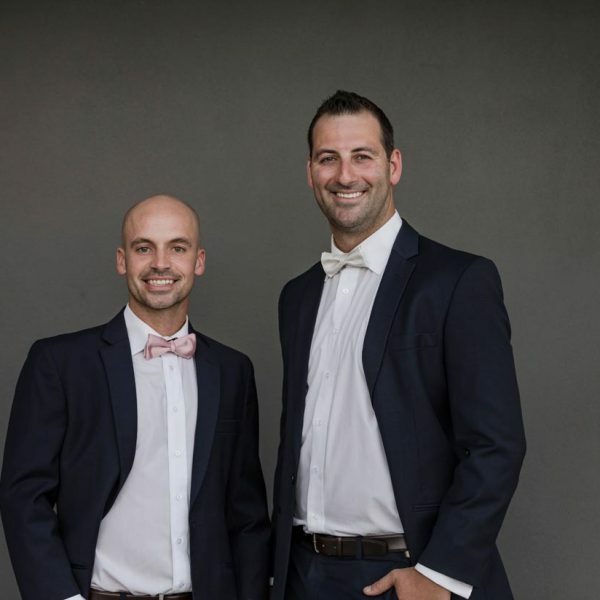 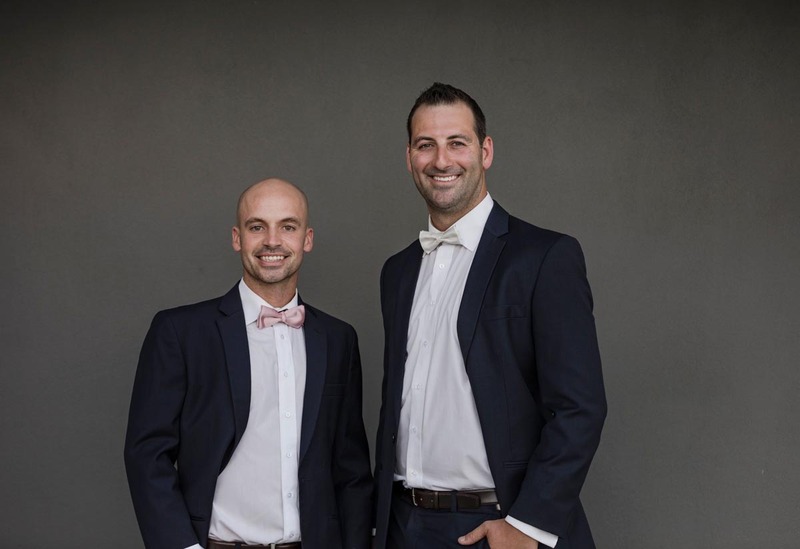 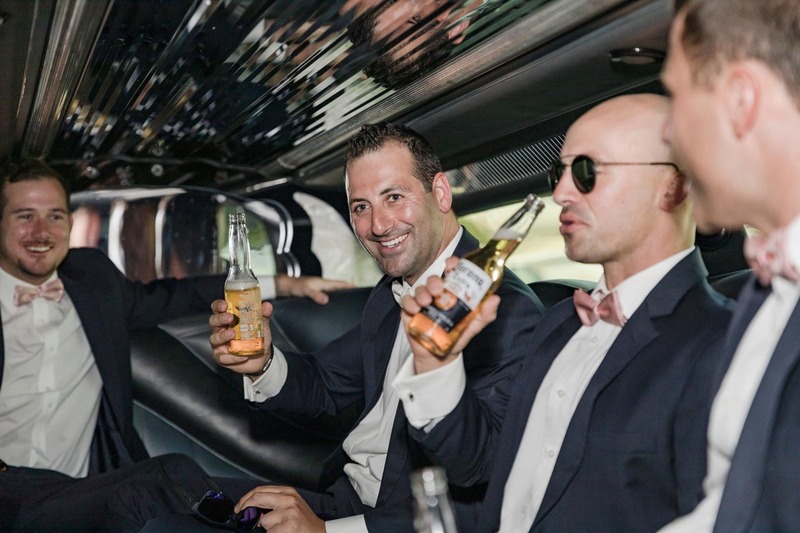 Jamie completed his wedding look with an ivory bow tie and dusty pink bow ties for his groomsmen, a great way to distinguish the groom from groomsmen. 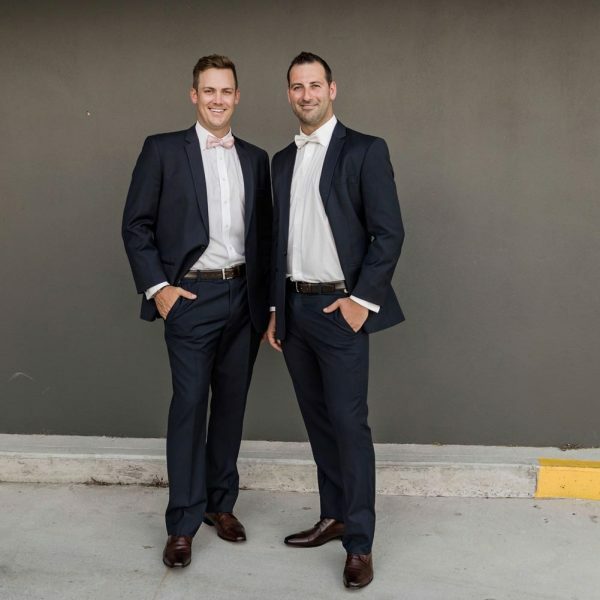 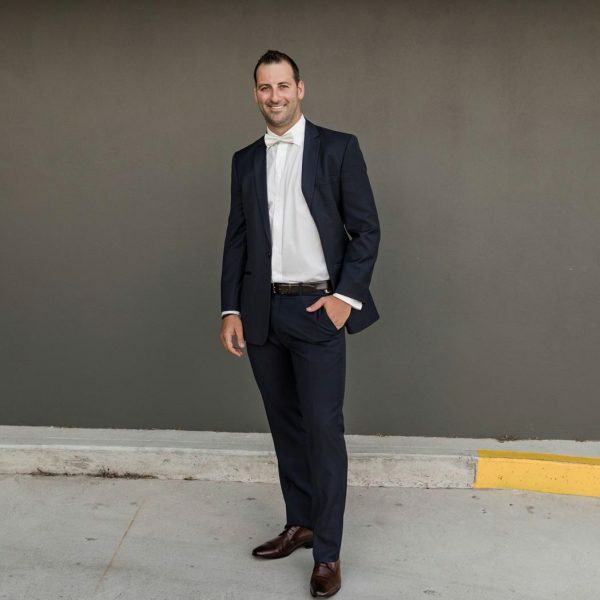 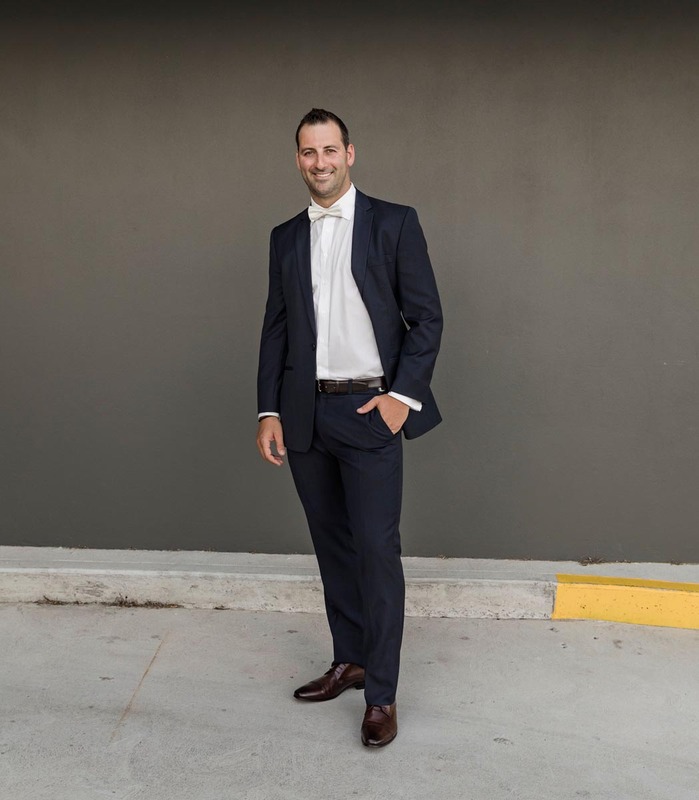 “Our experience with Rundle Tailoring was second to none. 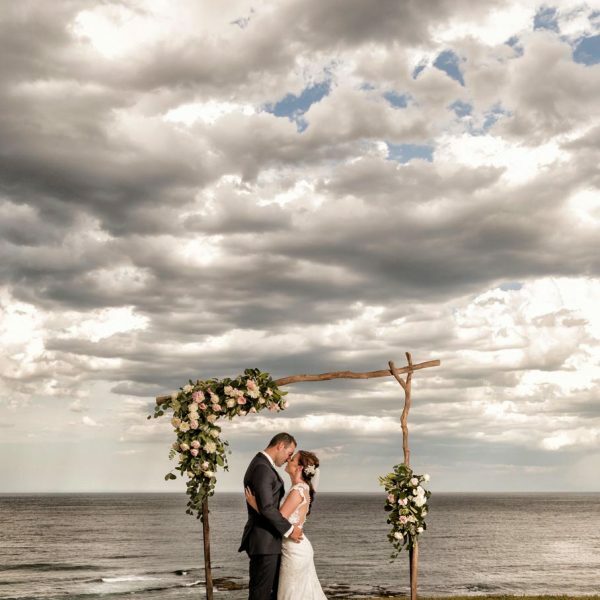 From the moment we walked in, we received guidance and suggestions on what would work best for our special day. 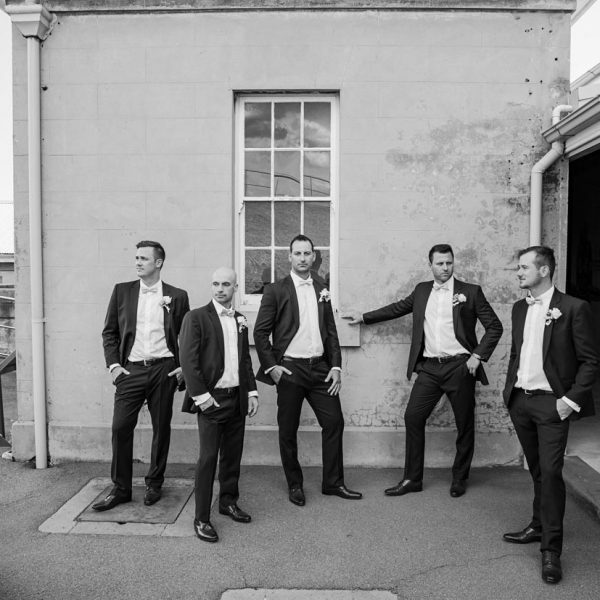 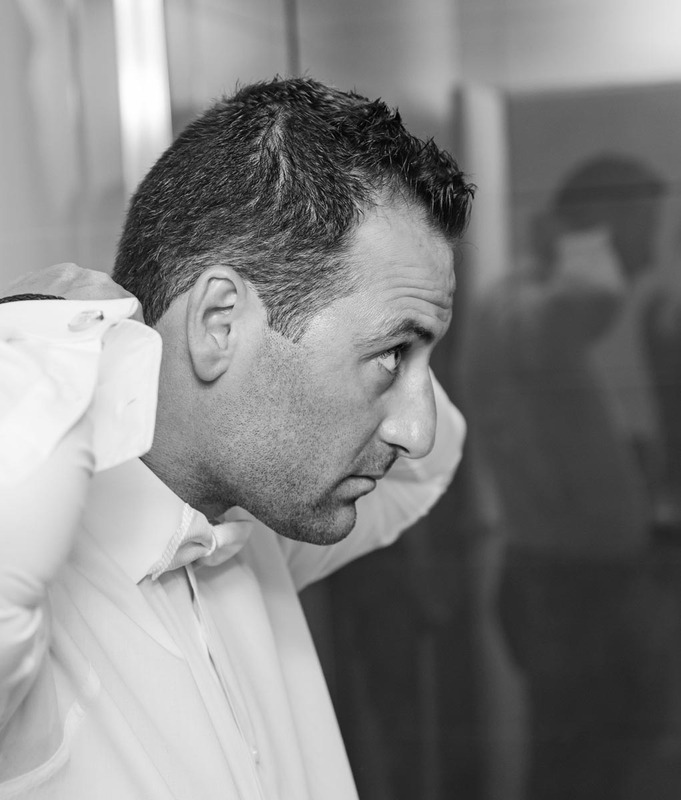 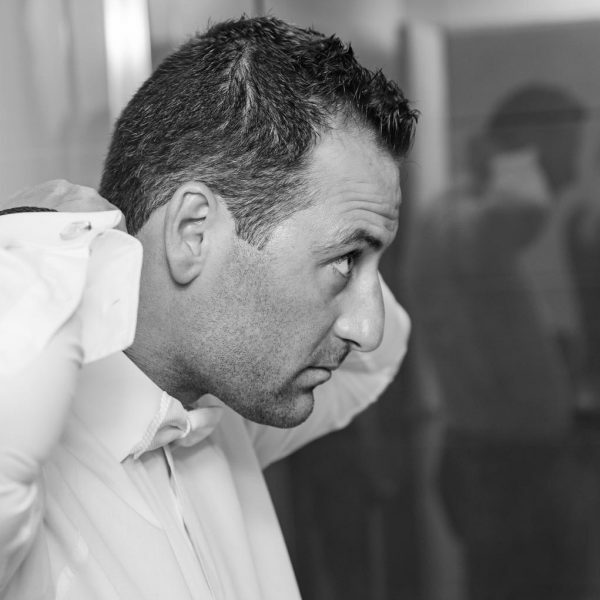 We were always given ample time to have fittings for both the groom and the groomsmen. 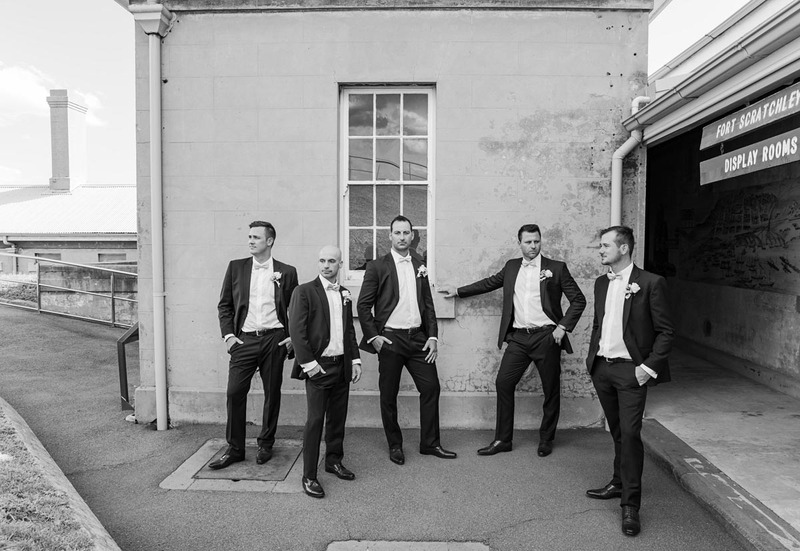 The suits looked amazing and the boys were very happy with the whole process and end outcome. 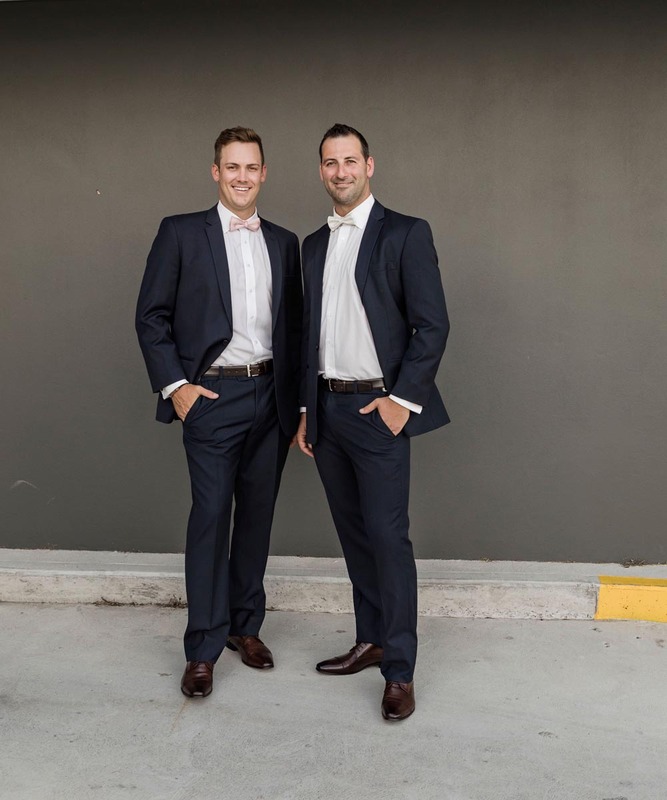 Overall a very positive experience.” Says Amie about their experience with Rundle Tailoring. 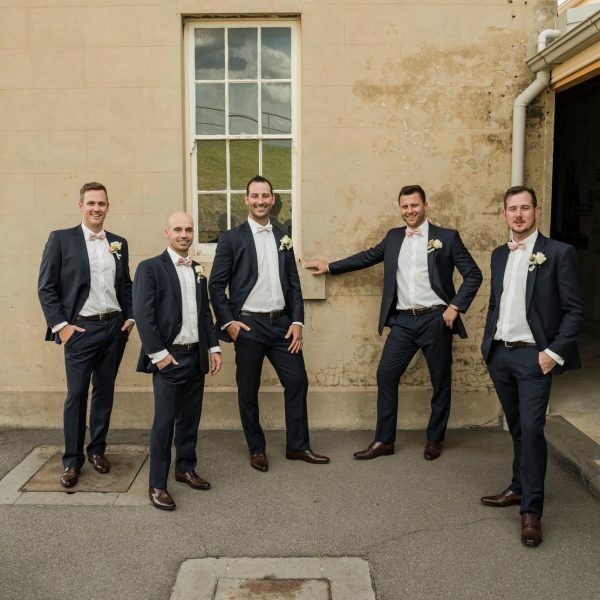 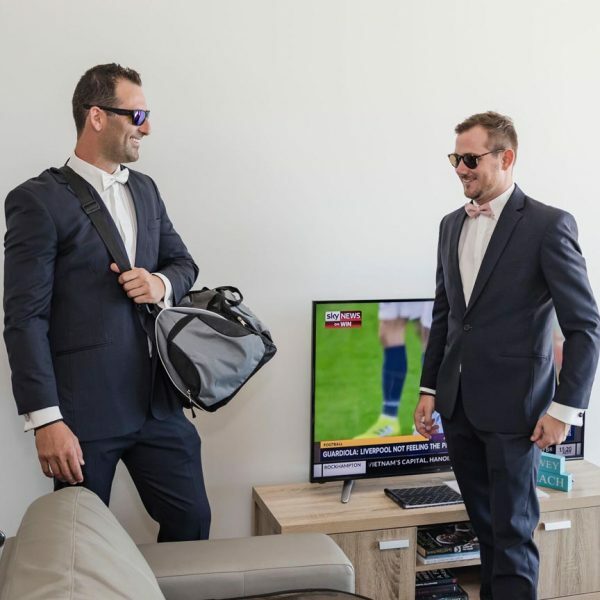 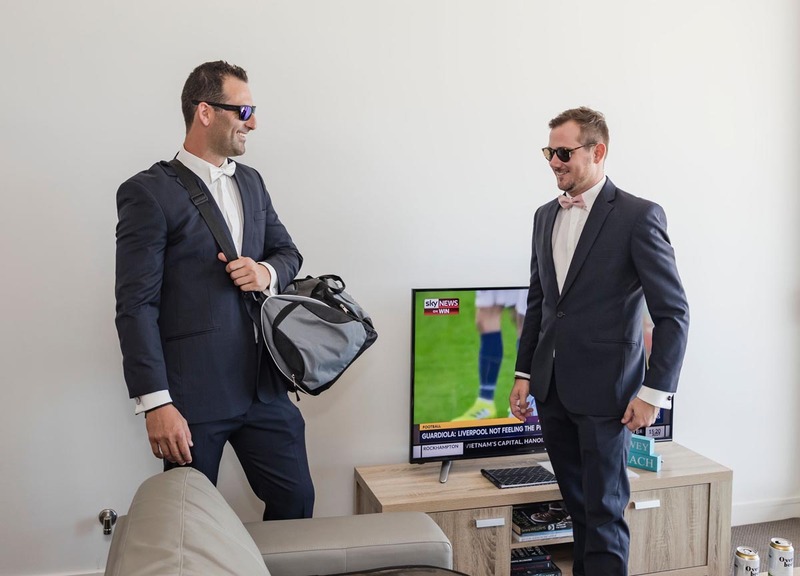 When collecting your formal hire suits, make sure the groom and all the groomsmen try on their outfits to ensure they fit perfectly. 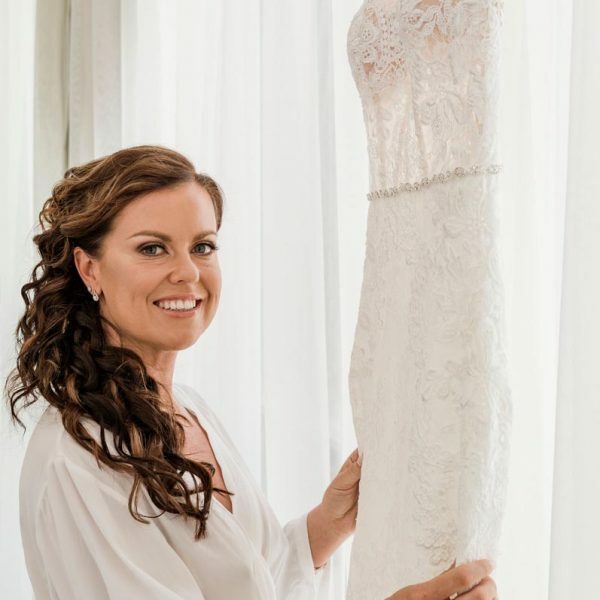 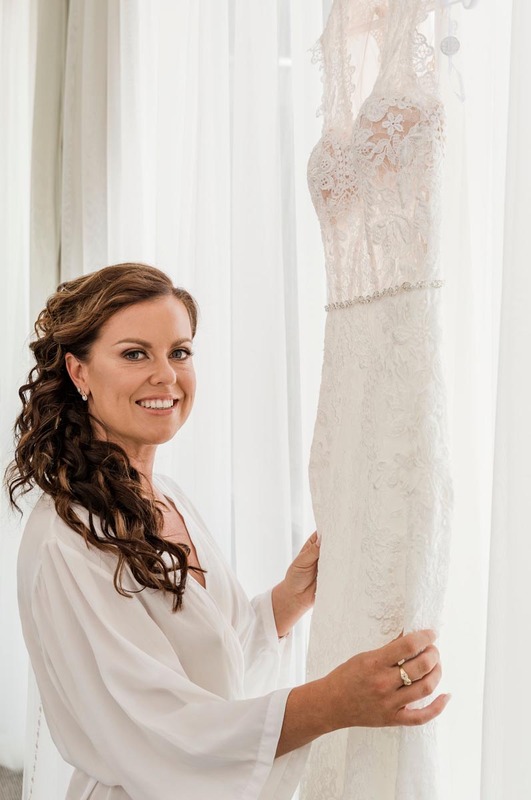 This is a final check incase any size changes with the wedding party measurements from initial fitting which could have been months earlier to the wedding day. 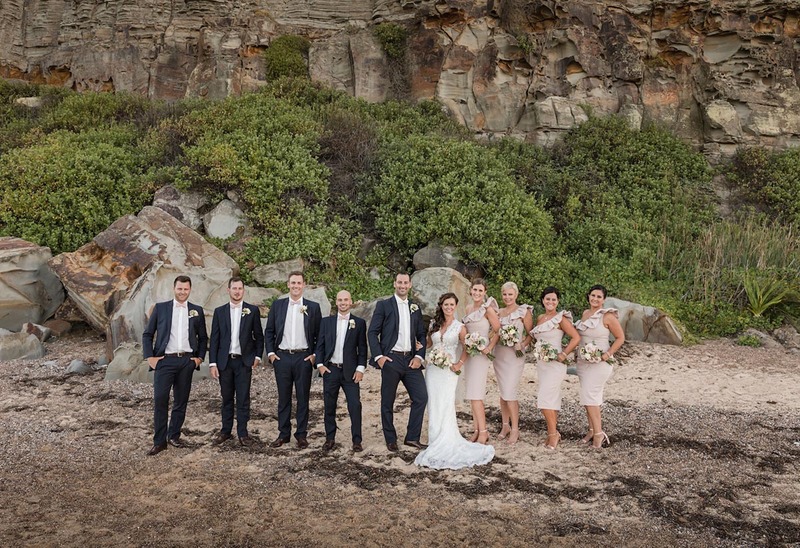 Photographer: Thierry Boudan Photography // Florist: Stix n Stems // Styling: Exotic Lily Event Hire and Love Glows // Ceremony: Cliff Top Fort Scratchley // Reception: Merewether Surfhouse // Catering: Merewether Surfhouse // Bride gown: Newcastle Bridal House – ‘Brandy’ by Zavana Bridal // Bridesmaid dresses: Forever New // Rings: Simon Curwood Jewellers // Hair: Melanie Phillips – Salon 187 // Makeup: Napoleon Perdis Kotara // Music: Mark Wells // Celebrant: Rebecca Dujin // Transport: Arrive First Class – Pearl White Chrysler // Band/DJ: Mark Wells Trio // First Dance: Choreographed by Your First Dance Co.